The screen shot above depicts a service record example for GoDaddy. Most of the fields in this dialog are self explanatory, but some fields require brief explanations. API Key, and API Secret: The API Key and the API Secret fields are both comprised of random alpha-numeric characters. The API Key and the API secret are created at the GoDaddy Developer site. Follow these steps to view your API Key and to recreate your API Secret. Go to the developer.godaddy.com, and select the "Keys" button. If prompted, login using your account credentials. If you had not created your API Key and API Secret before, a window will pop-up with your Test API Key and Test API Secret. Test API Key and API Secret are not sufficient, you need to create Production API Key and API Secret. Select the ⊕ symbol to the right of the "Production" title. A window will pop-up with your API Key and API Secret. If you had created your API Key and API Secret previously, scroll down to the "Production" section. Select the symbol to the right of the "ProductionKey" title. A window will pop-up with your API Key and new API Secret. 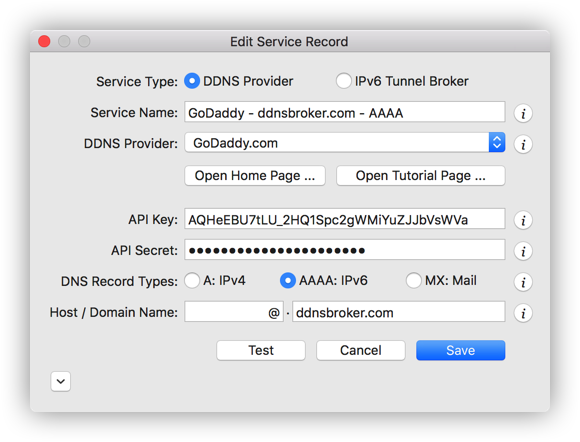 DNS Record Types: GoDaddy supports dynamic DNS records of type A, AAAA and MX. Host / Domain Name: When creating a DDNS record for a root domain, use "@" as the host name.